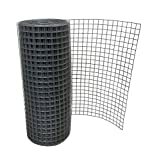 This offer is for a roll of 1″ x 1″ aperture size welded wire mesh, manufactured in 19 gauge wire. Available in 24″ (60cm), 36″ (90cm) or 48″ (120cm) width, and a roll length of 30m (98.4 ft) in 24″/ 36″, and 25m (82ft) in 48″. Hot dipped galvanised after welding, this wire mesh is ideal for use in aviaries or small pet enclosures. Widely Use for garden fencing, hutch and kennel manufacturers, poultry enclosures, insulation retainers, storage bins, decorative supports. Lightweight And Easy To Assemble Pet Cage 8 Panel Metal Small Fence 24-Inch - Suitable For Dogs, Cats, Chicken, Pig, Guinea, Rabbit And Hutch - It Provides Cozy Room For Pets Playing And Relaxation - Includes BONUS Ebook Series 'YOUR PERFECT PET GUIDE BY E-COMMERCE EXCELLENCE'. This entry was posted in Birds and tagged 24x30m, Fence, Galvanised, Grid, Holes., Mesh, Metal, Panel, Roll, Sheet, Steel, Welded, Wire by One Boutique. Bookmark the permalink.